Although the Colorado River runs 400 miles through Utah, there are only a couple of bridges that cross it. The Dewey Suspension Bridge was built in 1916 but was accidentally burned down in 2008. 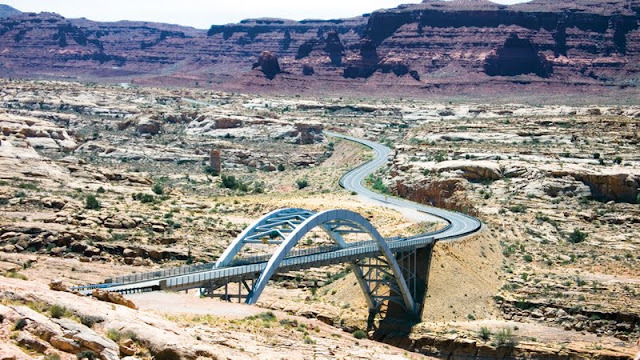 An unnamed bridge on US Route 191 was built in 1955 and crosses the river near Moab. The Hite Bridge on State Route 95 was built in 1966 and crosses the Colorado River near the town of Hite. Arch bridges are a good choice for crossing deep river canyons. The arch supports can be founded on hard rock and can span up to 300 meters. The Hite Bridge is a steel, through arch with box girder arch ribs and I-girder cross-bracing. A through arch supports the deck from below (with spandrel columns) and above (with cables or ties). The ends of the arch ribs are pinned to reduce bending in the arches and to simplify the analysis. The stark landscape enhances the bridge's beauty. Note the change in color from Jurassic Cedar Mesa Sandstone on the desert floor to Triassic Moenkopi Formation on the buttes. Lake Powell was formed by the Glen Canyon Dam about 80 miles south of Hite and a marina was built at the northern tip of Lake Powell in Hite. However, years of drought have shrunk the lake and left the marina stranded. Arch Bridges: The Hite (Colorado River) Bridge by Mark Yashinsky is licensed under a Creative Commons Attribution 3.0 United States License.